East Coast Diversified Corporation’s RFID and GPS division, EarthSearch Communications, announced its newest product offering, the LogiBoxx certified hand held RFID reader: the ES3001H. 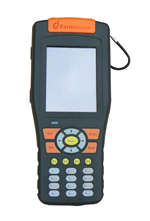 The device runs on the latest mobile operating system, Windows CE 5.0, and utilizes EarthSearch’s proprietary firmware. Depending on the tag it can identify items up to 15 feet, and it is also capable of reading 1D and 2D bar codes. The hand held reader features integrated GPS technology that is capable of wireless communication via UHF, WiFi, Bluetooth, and GPRS. And it can be connected to a PDA or PC to upgrade software and to customize its built-in features. The ES3001H is designed for use in shipping, inventory control, and asset management. Additional applications include the detection of counterfeit product, where write protection for memory in the tag allows it to distinguish between true and false goods.